Old buildings are more than bricks, stone, mud and mortar. In them we have material evidence of the past and a visual asset for the present and future. Inappropriate alteration or repair can cause great damage to the character and interest of these structures. 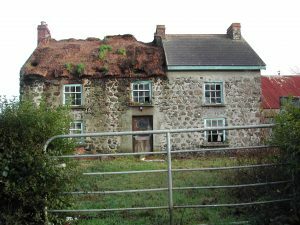 Current legislation should prevent demolition and more extreme forms of alteration to the exteriors and interiors of listed buildings; but often minor works to listed buildings and major changes to unlisted historic structures are left to the owner’s discretion. In such cases an appreciation of the building and its construction and the use of appropriate repair techniques will be of particular importance. Professionals with the traditional skills needed to retain the character of old buildings should then be consulted. Most people now accept that it is important to protect those great houses and national monuments which provide reference points – either good or bad – in history. About the need to conserve more ‘ordinary’ old buildings there is greater doubt. Often it is felt that these structures have nothing exceptional to contribute in architectural or historic terms and that their retention is unnecessary and prevents progress. But more humble historic buildings do have something to contribute, both on an individual basis and in a wider context. Frequently it is the simpler vernacular structures that form the architectural character of an area. Their materials, for instance, are likely to relate directly to the locality in which they were built in a way that modern structures made from mass produced materials often do not. Their form may well indicate their previous use and through this the past commercial or social role of the area in which they stand. Individually, although perhaps unremarkable, they are likely to contain evidence of design and craftsmanship generally not found in modern, mechanised construction. For instance the proportions of a classical facade, the undulations in old plaster and glass or the variations in colour and texture of hand-thrown bricks and tiles are all worthy of appreciation. To look after an old building in a careful and sensitive manner requires some knowledge of its history and constructional form. It also involves regular maintenance and the ability to distinguish ageing, which is gradual and pleasing, from growing problems. This may sound complicated but, with some good basic information combined with common sense, an appropriate approach should be possible. There are some significant differences between traditional and modern forms of construction which should be appreciated as the basis for understanding an old building. A full explanation of this subject is not possible here – information such as that provided in the Society for the Protection of Ancient Buildings’ pamphlet, ‘The need for old buildings to ‘breathe’‘ can help with this – but some of the fundamental differences include solid rather than cavity wall construction, the absence of modern forms of damp proof courses and membranes, and the use of ‘breathing’ rather than impervious materials. In essence old buildings normally have a ‘softer’ form of construction which allows a greater amount of structural movement and migration of moisture. This may sound alarming but problems are only likely to arise if maintenance is inadequate, if incompatible modern materials are introduced (such as hard cement mortars, plasters and renders which hinder the evaporation of moisture unlike traditional lime-based mortars which allow it to take place) or if structural alterations are made which interfere with the way in which a building was intended to perform. The masonry of a building is not merely the structural material linking the building’s architectural features; the type of material used and its treatment are essential parts of the building’s character. Traditionally there was, in general, an intention to create a unity in the surface of the wall rather than to emphasise the presence of bricks or stones in the construction. Thus modern ‘ribbon’ pointing, which creates mortar joints raised from the surface of the masonry, is almost always inappropriate for an old building. Rubble stonework was very often unified by a coating of render and/or limewash. Where used, traditional specialist techniques, such as tuck pointing – where the irregularities of the bricks are first disguised by a mortar that matches their colour, and then this mortar is scored with a narrow line which is itself pointed to produce the appearance of a neat and slim joint – should be respected as an essential part of the character of the brick wall. Regular checks should be made on the condition of the masonry and mortar joints. 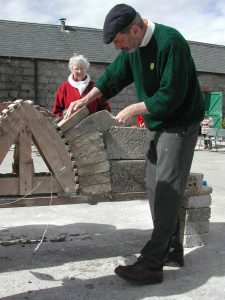 The mortar, traditionally lime-based in most cases, should be softer than the surrounding masonry. As such it is intended to be a ‘sacrificial’ element of the building where erosion will occur. It is usually felt that re-pointing is required when the depth of recession exceeds the width of the joint. The growth of vegetation near to and within the masonry also needs to be controlled as damage may result. Any significant structural problems with masonry are likely to require professional involvement but the owner should watch for evidence of on-going movement such as the widening of joints. However, cracks and distortions are not necessarily a problem; in some cases they will have occurred early in the building’s history and will not be a continuing cause for concern. More detailed information can be found in ‘Section 1: Masonry: Stone & Brick’. Ensuring effective rainwater disposal is a crucial part of good maintenance. Water should be rapidly channelled away from roofs or other surfaces so that there is no risk of unwanted moisture penetrating the structure. It is also essential that there is a satisfactory means of taking water away from the base of the building so that it does not affect foundations or cause decay through excessive ‘splash back’ onto the walls. Roof coverings are often attractive as well as functional elements of a building. Wherever possible traditional materials should be used for re-covering roofs. This should apply not only to slates and tiles, where natural/handmade types are greatly preferable, but also to thatch which should be appropriate to the locality in terms of material and detail. Slipped slates and tiles, copings to gable ends and the gradual decay of thatch should all be watched and remedial action taken when necessary. The condition of gutters and downpipes should be regularly monitored; occasional inspections during heavy rain showers can be a revealing way of seeing how the rainwater goods cope with water from the roof. At other times stained masonry is likely to indicate that there is a defect of some kind such as a blockage or crack. At regular intervals – ideally in the Spring and Autumn – leaves and other obstructions should be cleared. Heavy snow can also cause blockages and flooding as it melts – if this is of particular concern snow boards or other modern alternatives can be used to guard against potential blockages. Also to be considered is the condition of lead flashings to chimneys and junctions and other leadwork, such as to valley or parapet gutters and to door canopies or bay windows. Leadwork will not last indefinitely and ultimately will need to be repaired or replaced. The involvement of a specialist is then advisable. More detailed information can be found in ‘Section 2- Roofing: Slating, tiling & thatch’. The detail of traditional joinery is most important to the character of an old building. ‘Off the peg’ modern replacement doors and windows can bear a superficial resemblance to earlier examples but generally they lack the interest of the original in terms of form and detail. Particularly unsuitable are modern units in PVC-U, aluminium or tropical hardwood. Even if they make an attempt at a traditional design they are almost invariably a very poor substitute; typical unsatisfactory details include glazing bars stuck onto plate glass, fanlights incorporated into doors, over-reflective double glazing and imitation sash windows where sashes pivot rather than slide. Contrary to some manufacturers’ claims, there is also evidence that PVC-U does not have a great life expectancy. 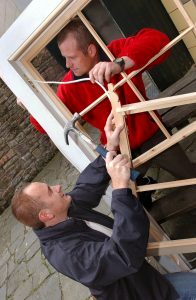 Timber windows and doors, if properly maintained, can last almost indefinitely. Similarly old glass, including crown or cylinder types, differs significantly from modern forms. Old glass should be valued for its colour and texture; these factors can make a surprisingly important contribution to the character of windows. Retention of old glass avoids the mechanical, lifeless look that can occur with modern replacement fenestration. Regular maintenance of traditional windows and doors should include repainting, lubricating hinges and other sliding parts and checking putty to glazing for cracks. If required draught proofing, or secondary glazing, can be installed without harming the fabric of an old window or door. Interiors of traditional character should be appreciated. Modern replacement fittings such as doors, skirting boards, fitted cupboards and door furniture are likely to date quickly and lose their attraction whereas a well maintained traditional interior will retain its interest and is likely to become increasingly important to the value of the building. In most cases there should not be any major conflict between modern living and the retention of historic features. Evidence of internal decay such as damp patches, deteriorating plaster and fungal attack to timber may indicate problems connected with the building’s basic fabric and disposal of rainwater. However, poor ventilation combined with the evaporation of water from baths and kettles may be responsible for some of these problems. In all such cases it is necessary to find the problem and resolve it before further difficulties arise. A basic understanding of the form of construction, careful and regular maintenance and the use of appropriate traditional skills and materials are of fundamental importance to the care of historic buildings. With these, buildings are unlikely to cause problems and the varied qualities that contribute to their historic character, whether grand or humble, can be fully appreciated.